"Although our old pool screen had little damage apart from some minor tears the annual summer battle with tiny bugs getting through the mesh spoiled many days outside and created a lot of work cleaning the pool. In the past Jim and Steve had helped us with garden and irrigation projects - all with excellent results. So, when it came to re-screening, we had no hesitation calling upon these experts once again. The work carried out was of the highest standard and finish. Work started on time and was completed as arranged. The first two days of torrential rain did not deter Jim and Steve - they carried on and never stopped until their day's work was done....that type of dedication and customer service is rare to find these days. We will definitely be using Ludlows Services again and will most certainly recommend their services to others. Thank you gentlemen - our pool screen looks brand new and we are looking forward to future bug-free summers in our pool area"
We highly recommend Ludlow Services for your lawn, landscaping and pool maintenance needs. Not only are they good, but they solve problems quickly and with great integrity. Jim Marshall, in particular, sets a high standard for ethical behavior, Try them - you won't be disappointed! "Wow what a difference! New sod after tree and old grass removal at our home. Outstanding service at a fair price by Ludlows Outdoor Services...thanks guys"! "Jim & Steve work with many of the vacation property and commercial property managers in the Four Corners area (Davenport, Clermont, Kissimmee, Orlando). Their teams work efficiently and effectively in keeping lawns and landscaping looking their best throughout the year. 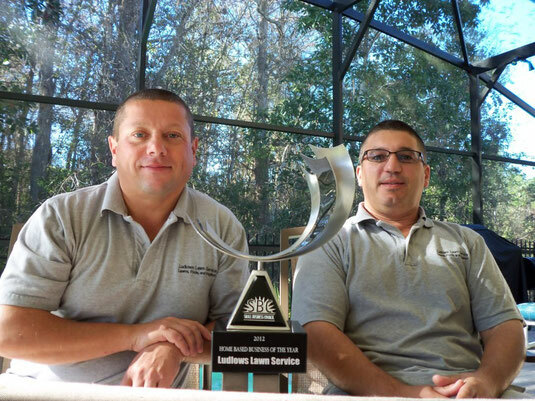 In Central Florida, that is not an easy task but Ludlows does it well". "Thank you so much for the great job of trimming in our backyard today! It looks great"!